I know it sounds crazy, but Ramps stole my culinary mojo. I had been reading about them on a daily basis. They seem to be everyone's go-to ingredient when writing about exciting things to eat this Spring. I was intrigued, so intrigued that I made a special trip to track them down, and tediously read everything I could find to learn more about them. That is where the problem began. I think it caused me to lose the nerve to cook anything for a few days, paralysed by a loss of confidence. The more I read, the more I began to fear cooking with this really strong smelling member of the Allium family. As various sites warned about the negative effects of eating ramp dishes,"don't be surprised if people continue to keep their distance after a few days have passed! ", and "Just beware of ramp belches; warn your co-workers and share at the lunch table", I quickly began to lose my nerve to give this harmless looking vegetable a try. I mean, why chance the potential embarrassment for a wild leek? I began to obsess for recipe ideas that would sound so delicious I'd be willing to risk people on the subway moving a seat away from me (now that I think of it, that might not count as a bad side-effect). Ramp risotto, and scrambled eggs with ramps seemed to be ubiquitous, and failed to entice me. Pickled ramps was what I was leaning towards, but laziness kicked in, and since I didn't have a supply of canning jars laying around (although I might change that in a few weeks, once the CSA starts), I chose not to go buy them. What I settled on was Roasted Ramps. As roasting brings out the sweetness in an ingredient, I felt it might help the flavor, or at least make it taste better than it smelled. One problem was how long to roast them, and how high. They are substantially smaller then their cousin the leek, more like a scallion as you can see. I actually procrastinated so long on this decision, that I lost the tops. The green wispy part of the ramp, that is also edible, shrivelled up after some time in my fridge. That's when I realized it was time to act, or wait until next year. I kept coming back to a post by Meg from Megnut.com that seemed like a fail-proof idea. So, following her cooking temperature and time, I made a few quick additions and I was back in the game. I am happy to report that I did not suffer any of the forewarned after-effects of eating ramps, but maybe that's because the roasting helped with that. I'm sure it would have been worse if I ate them raw. I must also report, for the sake of being totally honest, I don't get what all the hype is about. Sure, they were fine and a good way to add flavor to otherwise bland partners (potatoes, rice, eggs) but the flavor was somewhat subtle. I can't say that I'd prefer them to regular leeks, or onions, or garlic for that matter. But, I did enjoy the idea of eating a wild growing ramp that would only be around for a few weeks, and I think in the end, that's what really made the dish a bit special. Adapted from Megnut.com's recipe found here. Keep in mind, this is more of a guideline than a recipe, any potatoes, or any additional seasoning would work great here. 1 bunch of ramps, cleaned and cut into equal size pieces. Preheat oven to 375 degrees Fahrenheit. 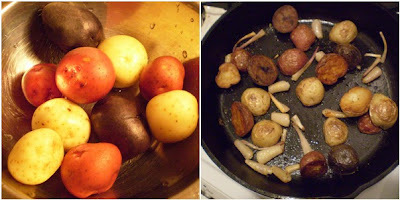 Prep the vegetables, slice the potatoes in half. Place a good swirl or two of olive oil in an oven-proof pan and allow to heat up. 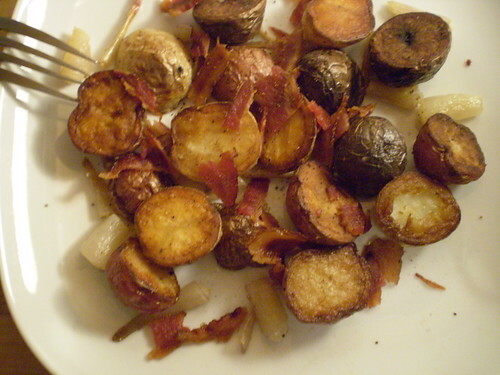 Toss the potatoes in and season with salt and pepper. Cook, stirring occasionally for about 5-7 minutes, or until the potatoes start to look crispy. (This step will ensure that your roasted potatoes have that good crisp exterior without the extra cooking time.) 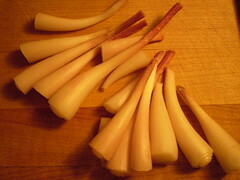 Place pan into the preheated oven for 10 minutes, and then toss in the ramp bulbs, or bottoms. Make sure to stir it all together to coat the ramps with the oil and seasoning. Place back in the oven for an additional 10 minutes, or until the ramps appear soft and fragrant. Meanwhile cook the bacon slices until crispy, then crumble and reserve. After ramps have been roasting for about 10 minutes, that's the time to toss in the leaves (as you should, unless you're me and let them sit too long in your fridge) and allow them to cook for an additional 5 minutes. Take out of the oven and mix in the bacon pieces and some chopped parsley or cilantro for color. Enjoy with the eggs of your choice, or really any main course.